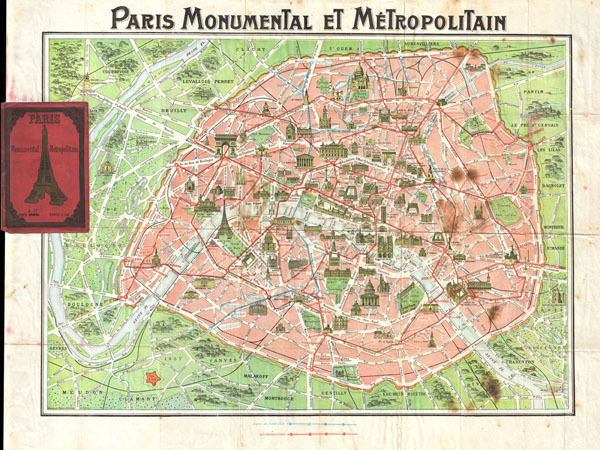 This is an extremely attractive c. 1920 tourist pocket map of Paris, France. Covers the old walled city of Paris and the immediate vicinity. Important buildings are shown in profile, including the Eiffel Tower. Shows both the train and Metro lines throughout the city. Though undated we can assign an approximate date due to the development of the subway system and the map's overall style and construction. Attached to original red paper booklet. Prepared by Robelin. Very good. Some discoloration from original booklet, upper left quadrant. Also, some foxing on the right hand sides of the map.